Maybe it was because I didn’t like seeing my uneven nose and un-chizzled cheekbones. Maybe it was because I didn’t like the way my hair fell flat along my face. Or the dullness of the colour. Maybe it was because of the extra pounds that I’d been carrying around with me and tried so desperately to rid myself of; a graphic reminder of my lack of self-control. Today, I’ve invited optimism and life coach, international motivational speaker and author of The Optimist In You, Jessica J. Lockhart, to talk about the complicated relationship most of us have with the mirror. You look in the mirror. Your image looks back at you. But do you truly see yourself? Do you see your soul, your being, your humanity? Do you see the person behind the mirror? Most people don’t. A task to be performed: have you ever shaved or put your make-up on without actually seeing yourself? Have you ever brushed your hair or your teeth without noticing anything about your being? 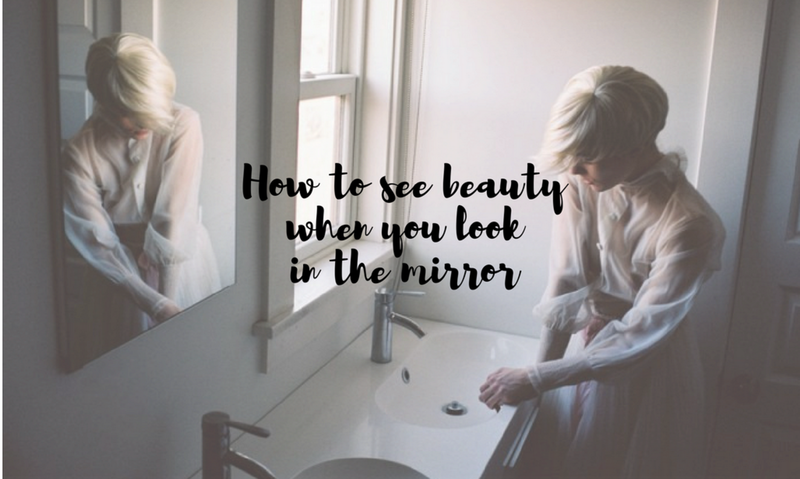 Many people look at the image on the mirror without really seeing anything but the body parts that need immediate work. And even then, those parts are abstract noses, undefined hair, necessary teeth… They don’t belong to them. They are as alien to them as the onion they will chop later in the day or the book they will hold in their hands. They might devote twenty minutes to fixing their hair without really taking it in or seeing any other part of their bodies. The rest of them is just a blurred nothingness. That negative feature of theirs: many people look at themselves in the mirror and only see what they look for and expect: a big nose, a fat/skinny body, messy teeth, unruly eyebrows… whatever. They don’t really see themselves. They look for the defects they know they have and only see those. They approach the mirror already knowing that the image it will give them is that which bothers them. They are not contemplating those body parts in the context of their own body but just as individual, problematic pieces. Their eyes and brain only perceive those. Once more, the rest of their being will just be a blurred nothingness staring back at them. A stranger with no connection: when you look at yourself in the mirror, do you have the feeling that you actually know that person who’s staring at you? Or is it more like a color shadow of yourself, an empty shell, a reproduction of sorts that has no feelings, no soul, no thoughts? Many people look at their images and feel totally detached from them. They feel like they’re looking into some tv character with no connection to themselves. It’s like looking at a portrait of another person they are vaguely acquainted with. A mask: some people are so convinced that they are a certain way, that that is what their brain actually registers and makes them see… even if it’s not true. A very clear example of that is the fat or chubby image an anorexic person confronts at the mirror when their reality might be painfully different from it. We all form images of what we see in our minds. Sometimes, those images are biased and transformed by our limiting beliefs. When facing them, we don’t actually see what there is, but what we believe there to be. Many people can’t make an accurate description of themselves because they never take the time to really look. As they don’t like the idea they have of themselves, at a certain point in time they decide to stop looking altogether. That’s when they start piling mask upon mask or just avoid seeing reflections of themselves on any surface. What if I told you that you are not the same person that looks back at you every morning from your bathroom or bedroom mirror? If you don’t believe me, check it out for yourself. Pick up a mirror right now and look, really look at your being, at your human representation, at yourself, at your self. Look first into your eyes. Look at their color and depth, at their gaze, at the way they are surrounded by your lashes and framed by your brows. Then, surf over the rest of your body and find the one thing that you like the best. Look at it. Really, truly look at it and enjoy the beauty of it. It’s perfection or lack thereof. It’s reality. It’s solidity. It’s uniqueness. It’s singularity. Continue discovering the rest of your face little by little, just looking. Just seeing. Analyse what your cheeks really look like; what kind of lips you do have; how your chin frames your mouth. Observe how far your eyes are one from the other, how many freckles you have on your face, if any, how the color of your hair and the color of your skin combine with one another. You might feel tempted to go back to your old routine of “unseeing” yourself. Not yet, please. Give yourself a chance. Just a few more moments. Make a conscious effort and look into your eyes once more. Look deep inside and try and see the real you, the being, the soul that is there. Feel the pain, the sadness, the love, the compassion, the tenderness… let your feelings be whatever they need to be. Be with yourself for a few moments. See your true self now. And give yourself permission to be what you are. Because there’s much more to you than just that blurred nothingness that you’re so used to seeing. Instead of avoiding your image from now on, why don’t you chose to see one little part of you each day? Focus on one thing each morning. Just one. And really see it. Open yourself to seeing it and accepting it. Even if you don’t find it perfect. Because that little part of you is you as well. Once you see it, contemplate it in conjunction with the rest of you. Observe how it fits in with the rest. Do that everyday until you see your complete self as it is. I bet you’ll discover that you’re not at all what you used to see. Give yourself the chance to know who you are and what you truly look like. You will be surprised! Enjoy life… all of it. Jessica J. Lockhart is an expert in humanology, a discipline that studies human beings with the objective of helping them be happier. To do so, she developed her own working methods and strategies to approach and tackle problems under an all-encompassing humanology concept. Jessica uses all the tools she learned and designed throughout her extensive career in order to help human beings continue growing, advancing and overcoming their daily obstacles through talks, courses and private coaching sessions. Jessica wasn’t always such an optimist. As a result of two car accidents, she was in constant, acute pain for more than seven years and every doctor told her she would need a wheelchair and constant care. One day she realized that she was not herself anymore and decided to recover the optimism she had lost to pain and sadness. She then went on to develop the Optimism Coaching method and wrote The Optimist in You. Thank you so much Jessica! Even though I’ve already gotten so much better at looking at myself in the mirror, I can definitely learn a thing or two from this. And I am certain my readers can as well.